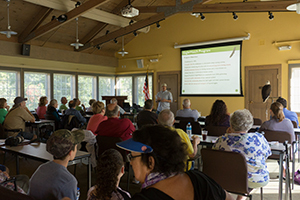 Based at Audubon Center for Birds of Prey, Audubon EagleWatch seeks information about Bald Eagles, active nest locations and possible disturbances or threats to nesting activities. As one of the premier Citizen Science programs in Florida, EagleWatch works to protect approximately 20% of the states nesting pairs. Nearly brought to extinction by hunting in the late 1800s and later by the use of DDT in the 1950s, the bald eagle has made a comeback, but their numbers are not evenly distributed along their historical range. Thanks to the Bald Eagle Act issued in 1940 and the banning of DDT in the mid 1970’s, more people can enjoy this majestic bird. Florida is the state with the third highest breeding density, only surpassed by Minnesota and Alaska. Their current threats include habitat and nest destruction, collision with vehicles, and territorial fights. With the current ongoing land development, many eagles are choosing to nest on man-made structures such as power line and communication towers. These non-natural nest sites can introduce many hazards to the young eaglets when they fledge. 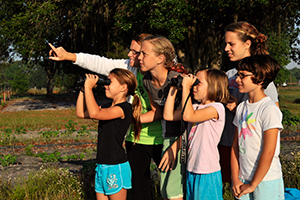 The Audubon EagleWatch with assistance from its more than 250 volunteers currently monitors more than 300 eagle nests in Florida. Today the program reaches many communities statewide providing awareness of the eagle nesting activities and its conservation efforts. Below are the main objective of the EagleWatch program. Compile data for publication to document urban nesting activity. Identify potential threats to nesting success since most threats are related directly or indirectly to human activity. Educate the community about the bald eagles and their current threats. 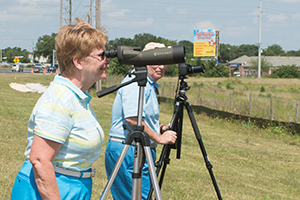 EagleWatchers Larry & Joan Hillock at work monitoring an urban nest in Central Florida. Young Eaglewatchers checking their nest for the first time. EagleWatch in the news. 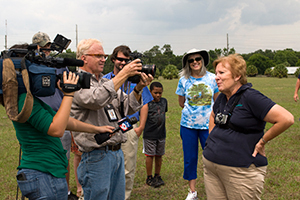 Lynda White's last eagle release before her retirement in 2012 as the EagleWatch Program Coordinator.